The Class Hierarchy View displays the class members associated with your program file. 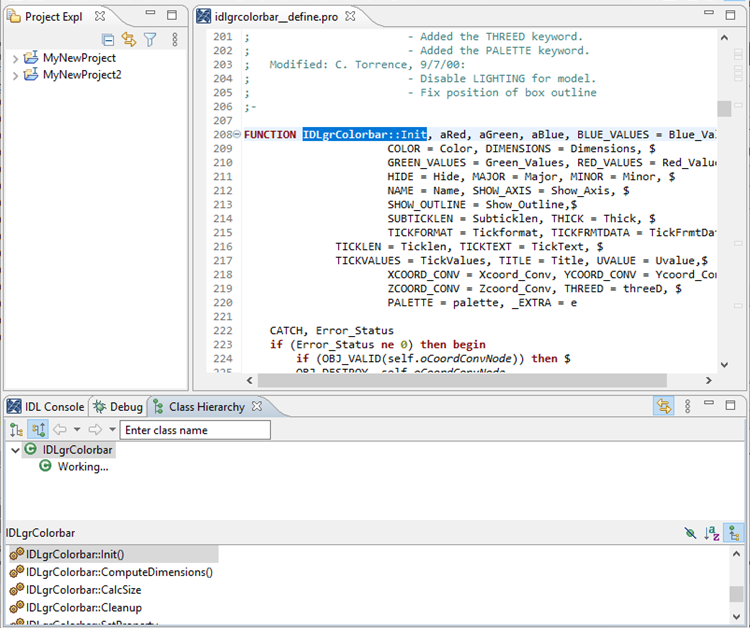 Note: Clicking on a name in the Class Hierarchy View will highlight the selected class in the Editor. The first set of buttons control the general functioning of the Class Hierarchy window. Link with Editor - Toggles the linking of your files to the Editor View. When ON, clicking the name of a routine/function call or property in the Class Hierarchy list will highlight the call in the Editor view. View Menu - Allows you to change the layout of the Class Hierarchy View. Subclasses - Shows associated Subclasses in your IDL path. Superclasses - Shows associated Superclasses in your IDL path. Show/Hide Fields - Toggles the display of properties in your selected program. Sort Alphabetically - Toggles the sorting of the members list. Show/Hide Inherited Members - Toggles the display of inherited members.